Whether we are attending a social occasion or dressing for the job, we all give some thought about what we are going to wear. For many social occasions, the decision is made for us, or it depends on how good we want to look. On the job, safety is more important than appearance, but again, some decisions are made for us. If you work in a factory or on a construction site, your employer may have special requirements. For example, factory workers may be required to wear safety glasses and safety high-top shoes. In construction, workers may be required to wear a hard hat. All industrial workers should be concerned about falling or being hit by falling objects, moving machinery, or industrial trucks. Welders should give extra attention to protecting themselves. From what does a welder need to protect him- or herself? On the job, welders are exposed to particular hazards. These include electric shock, arc radiation, air contamination, fire and explosion, compressed gases, and cleaning processes. Certain welding procedures pose specific safety hazards. For example, high-voltage electron beam welding (EBW) machines produce X-rays that must be shielded. Heat exposure that comes from welding inside a preheated weldment is another problem that requires special precautions. An arc welder must consider the powerful arc rays and the fact that he or she is working with very hot molten metal. Arc welders must protect themselves from both. Other hazards that a welder may encounter do not require special clothing, but the welder should use common sense. These include high voltage, electrical problems, falling or being hit by falling objects, and drowning in inert gas. Helmets. First, consider arc rays. They are generated in the arc and depend on several factors: the welding process being used, the amount of current being used, and how much time is spent welding. All arc welding processes produce arc rays that vary in intensity. To protect the eyes and head, a welder needs a helmet. The welder, who may choose a conventional-size viewing filter lens or a big-window type, should select the lightest weight he or she feels comfortable with. Some welders prefer a flip-up or self-darkening filter lens. The self-darkening ones are handy for short, intermittent welds, but they are more expensive than flip-up lenses and require maintenance. Companies usually do not supply these lenses to their welders. At least two types of self-darkening lenses are available—battery-powered and solar-powered. Both have helmets that are heavier than traditional helmets. The self-darkening filters in the lenses should be adjusted when the lens shade is changed because different processes require different shade numbers. Batteries should be replaced regularly in the battery-powered helmets. Another consideration is the darkness of the filter glass or the shade number of the lens. 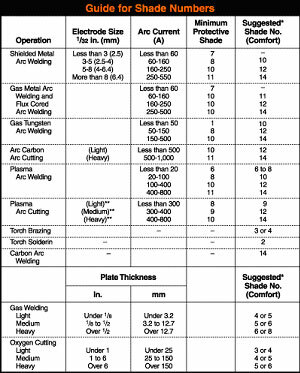 This standard comes from Safety in Welding, Cutting, and Allied Processes (see Figure 1) and is based on the welding process and current used. As mentioned previously, arc welding emits different intensities of arc rays at different welding currents. Using the correct intensity for the job can prevent arc burn of the eyes, but exposed skin also is a factor. If welders do not cover their skin, they risk receiving severe arc burn, which is like sunburn and can be painful. Welders should wear gloves, shirts with sleeves, and long pants. Some companies provide safety equipment, including helmets, for their welders. Others reimburse welders for buying the equipment themselves. If the required equipment is not provided or reimbursed, welders can claim deductions on their income tax forms for unreimbursed employee expenses. Spatter Protection. The welding position during arc welding is much more complicated than the issue of personal protection. Again, consider the arc welding process that is being used, the current level, and the amount of time spent welding. Spatter can be a serious problem when welding at high current and out of position. Where the weld metal crosses the arc, spatter and air contamination are produced. Spatter can be produced during shielded metal arc welding (SMAW), which also is known as stick welding, gas metal arc welding (GMAW), and flux cored arc welding (FCAW). Heavy spatter will burn through lightweight clothes and gloves. It will get in welders’ hair and down their shoes, so welders should wear leather gauntlet gloves, leather jackets, caps, and high-top shoes. These precautions apply to arc cutting processes as well. A cap is needed to protect welders’ heads from weld spatter, which also can go down their necks or in their shoes. People who are welding above head level, such as in the vertical or overhead position, should be aware that spatter from SMAW, FCAW, or GMAW can fall on their heads and burn hair and skin. In any position, if the welder is using high welding current, the spatter will fly high and get in the welder’s hair, which is why a cap is essential. If the spatter is severe, a heavier hat is useful. When weld metal does not cross the arc, for example during gas tungsten arc welding (GTAW), plasma arc welding (PAW), and carbon arc welding (CAW), little or no spatter is produced, and protective clothing is not as critical. In these cases, a welder can wear light-duty clothing, which can include woolen clothing and cloth gloves. In fact, people who weld for only a few minutes a day can bare a little skin. Air Contamination and Fumes. Air contamination and fumes create another problem for welders who are working with toxic materials or in enclosed areas. Welding or cutting coated, painted, or special metals can produce toxic fumes, which the welder should avoid. The welder may need to wear a respirator in cases of air contamination. For example, old structural steel that needs to be repaired may be covered with lead paint that produces toxic fumes when it is flame-cut. Steels to watch out for include galvanized (zinc-coated) tern plate (lead-coated), cadmium-coated, and even plastic-coated. These coatings should be removed before welding. In addition, toxic fumes are produced when welding on beryllium, copper, and lead. Welders should consult with their company safety officers if they are welding any of these materials. The welder should make sure adequate ventilation is provided. Local exhaust systems or fume-extracting guns are useful. Even when brazing, certain filler metals or fluxes contain cadmium, and extra ventilation is required. For serious ventilation situations, welders should use facepiece respirators with filter cartridges or air-supplied helmets with powered air filters or air-supplied hoods with a compressed air supply. Special planning is required for welding in a small, enclosed area such as a tank, vat, pressure vessel, ship compartment, or tunnel. Some situations require a lookout—a person to watch the welder. Workers should make sure that positive exhaust is provided and that fresh air is blown into the space. Welding with CO 2 shielding gas or even argon may displace the air and actually cause a welder to drown because of a lack of oxygen. This also can happen if welding in a small, closed room with an engine-driven welding generator. These engines produce exhaust that contains CO gas. A welder should consider possible exhaust problems before starting any application. Today, many welders work in factories that use resistance welding equipment and, most commonly, spot welding machines. Like arc welders, these workers should wear clothes that protect them from the flash or sparks that result from resistance processes. Such protection includes cover goggles with ventilation, but a helmet is not needed. Because these welders work with sheet metal with sharp edges, they also should wear heavy gloves. Welding is as safe or as dangerous as any industrial or construction job. In the end, though, it is up to the individual welder to protect him- or herself. This means following the safety suggestions of the experts and using common sense. Howard Cary is a Welding Engineer, Consultant, Past President of the American Welding Society (AWS), and Author of Modern Welding Technology, 4th edition (Upper Saddle River, N.J.: Prentice Hall, 1998).